One of my favorite investment strategies is the barbell strategy where I invest in lower risk companies or indices to hit singles and doubles while concurrently investing in more speculative companies to hit potential home runs. I’ve structured my after-tax investments to be more low-risk through structured notes, and my pre-tax investments in my rollover IRA, SEP IRA, and Solo 401k to be more high risk. Given my pre-tax investments can’t be touched until 59.5 without penalty, I find it easier to take more risks with such funds. My investments are solely a mixture of equity and fixed income to keep things as simple and straightforward as possible. My main goal is to come up with an appropriate asset allocation for my age and risk-tolerance, and let the investments perform as they may. Spending energy trying to beat the S&P 500 is a fool’s game. I’d much rather be traveling, playing tennis, building my online business, or writing with my spare time. I’ve recently invested into a new investment vehicle I’m very excited about. It’s called venture debt. For those of you who are accredited investors who like the barbell investment strategy as well, I think you will appreciate learning about venture debt in this article. A startup company can either raise money to fund operations through equity or through debt. Angel investors and venture capitalists are the earliest stage investors followed by private equity investors and then public investors once the company goes IPO on the NYSE, NASDAQ, or AMEX. Let’s say you are the CEO of a startup and you’ve raised $5 million dollars by selling 20% of your company through a Series A round. You find out that you need $1 million more for working capital a year later, but you don’t want to dilute yourself and existing shareholders by raising a Series B round. This is where venture debt comes in. A nimble venture debt fund will come in and lend short-term money (usually 1-3 years per investment) into private equity sponsor-backed companies at interest rates of perhaps 12-15%. Furthermore, the venture debt fund can sometimes negotiate warrants (a right to buy stock) for further upside potential. You might be thinking what CEO in their right mind would be willing to pay 12-15% interest a year and offer warrants. All you’ve got to do is think about the alternatives for a high-risk, money-losing startup. First of all, large banks don’t have the resources, the patience, or the expertise to invest in such startups. Neither do smaller boutique banks or credit unions. A bank like Silicon Valley Bank, which is deeply entrenched in the tech community can provide lines of credit at perhaps a slightly cheaper rate, but they are a retail bank first and foremost, and not a venture debt company. Second of all, if your company is growing at 10% month over month, paying 15% a year in interest is MUCH cheaper than selling equity that is growing at 200%+ a year. Maybe the equity isn’t growing exactly at the same rate as revenue growth, but it’s certainly growing faster than 15% a year. You want to own as much of your company as possible while ensuring its survival to allow for your equity to be worth something in the future. Finally, providing warrants to a venture debt company is a way of creating a longer-term partnership and lowering the interest burden. Perhaps if you didn’t agree to warrants coverage, then your interest rate might be 18% or more instead of 15%, for example. Meanwhile, it’s nice to know that after the loan is due, you should have an easier time borrowing money from the venture debt company who still has a vested interest in your company’s survival due to the warrants it owns. The word “venture” is in “venture debt” for a reason. Venture investing is early stage and highly risky if you are a straight up equity investor. Venture Capitalists will not see returns on most of their investments. But when one hits, it could be a 1,000% return or more as is the case with early investors in Uber, AirBnb, Facebook, Pinterest, and many more. But if you are a venture lender, the risk parameters are different. Your number one goal as a venture debt investor is to make sure that the company survives long enough to pay out the agreed upon interest and get your principal back. A venture debt investor doesn’t need the company to be bought, or go public, or be a runaway success. Given the investment duration is generally 1-3 years, the venture debt investor just needs the company to remain liquid during this investment window. Venture debt investors must not only analyze the legitimacy of the business model, but perhaps MORE importantly assess the likelihood that the company will be able to continue raising more money through equity fund raising. YADAC recently raised a Series A round of $2 million for 20% of the company. YADAC is therefore valued at $10 million dollars, but is losing $1 million a year. The CFO doesn’t forecast the company to break even for another five years. As a result, management and investors in the Series A round know that another round of fund raising is likely coming due in two years. The hope is that in two years, YADAC grows tremendously and the Series B round of fund raising will value the company much greater than $10 million. Fast forward two years later, YADAC grows by 10X and is able to sell a much smaller stake for $20 million dollars at a valuation of $100 million. YADAC is now losing $5 million a year as it has scaled up operations to dominate the online world of love. The CEO realizes he now has a 4-year runway to make something big happen until all the money runs out. Hopefully he’ll be able to figure out a way to become profitable by then so that he will no longer need to sell more equity in his company. A year after raising $20 million, he realizes the company burn rate is closer to $7 million a year. In other words, YADAC will run out of money in 3 years. To ensure the viability of his company, and to minimize the chances of raising another equity round, YADAC reaches out to a venture debt company to lend it $5 million at 15% a year over three years. YADAC wants the extra $5 million for working capital and marketing expenses if they need it. The hope is that they never need it, and simply have $75,000 a year in interest expense to pay before they can stand entirely on their own through profitability. The $5 million venture debt allows YADAC to survive for 10 more months worst case scenario. The venture debt fund manages a 10% warrant coverage on YADAC as well. In other words 10% X $5 million loan = $500,000 worth of warrants the venture debt company can convert in the future with the strike price equal to the valuation at the time of the loan. In retrospect, the best bet for the venture debt company would have been to lend money at 15% as soon as the Series A round was complete because YADAC raised another $20 million two years later. The venture debt company could have therefore earned 15% a year + warrants over at least 4 years, instead of just two years. If YADAC fails in year 5, the venture debt company still makes its 15% return, but only loses out on its warrants. Let’s say you find a great startup that is backed by Sequoia Capital, Accel Partners, and Draper Fisher Jurvetson. These are the guys behind Whatsapp, Facebook, and Hotmail among many more. You likely want to lend the startup as much money as possible during their Series A, B, C, D funding etc., because chances are high Sequoia, Accel, DFJ and other venture capital firms will throw money at the startup in future rounds, thereby ensuring you’ll get paid back. This is very similar to “the greater fool” approach to investing. It’s just that such fools are worth hundreds of millions of dollars each. Sure, such investors do their tremendous due diligence for you with tons of money and connections behind to support a company. When liquidity is flowing, valuations don’t matter as much, and the risk of default goes way down for venture debt investors. But as we all know, the good times don’t last forever! Otherwise, we’d all be mega millionaires. The venture debt investor must therefore properly ascertain market conditions, the company’s business model, the quality of investors behind the startup, and the likelihood that more funding will take place. The two main problems for venture debt funds is that it might be too small to be significant and the startup might be too in demand to accept the venture debt fund’s money. Creating term sheets and going through the legal process takes a lot of work. Some companies won’t even bother if you can’t lend them at least $5 million dollars, for example. Here are other benefits of investing in venture debt. 1) First lien on all assets – senior secured, full sets of protections. 2) Restrictive covenants including limitation on dividends and other requirements. 3) Senior position in the capital structure with participation in equity upside presents superior risk-adjusted return profile. In other words, if the company is faltering or on the verge of going bankrupt, the venture debt investors have a better chance of getting their money out before the investment turns to zero. The restrictive covenants are great for venture debt investors to ensure that the companies reach specific milestones before borrowing more money or executing another strategy. Borrowers obviously would prefer less covenants. Every single presentation you will receive as a perspective client will make the venture debt fund look amazing. I’ve sat in numerous fund raising pitches before when I was in banking and in my personal private equity investments. 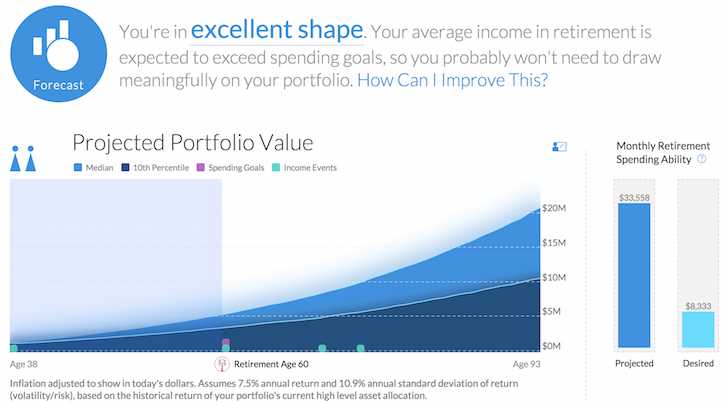 Every single presentation makes me want to dump my entire life savings into the company or fund! If I’m putting money into a fund for someone else to manage, then I’m mainly focused on the people running my money. I want them to have the best return profiles, have the most experience, and be the hungriest go-getters around. At the same time, I want to know they will be sticking true to their fund’s mission of investing in at least 60 companies with a 18% IRR target and a 2-3 year investment window or whatever the fund’s strategy is. I don’t want to wake up one day and find out they went all-in on some coal company in China when they are supposed to be investing in tech and internet startups. The cost structure is very typical to a hedge fund cost structure of 2% of assets under management and 20% of the profits. Although many funds have lowered their cost structure to 1%/10% to attract more capital. The fund I’ve invested in allows me to participate in the venture capital and private equity space in a lower risk way with a target 20%+ expected return profile per annum and a blue-sky target of 30%+. The minimum preferred return is 8% per annum, which is just fine by me given that is 3X the 10-year yield (my constant return bogey). If I can achieve a 8% annual return with relatively low risk, I am allocating as much capital as possible to such an investment given our low interest rate environment. Anything over 8% is gravy to me. One of my favorite new investment type is real estate crowdfunding. 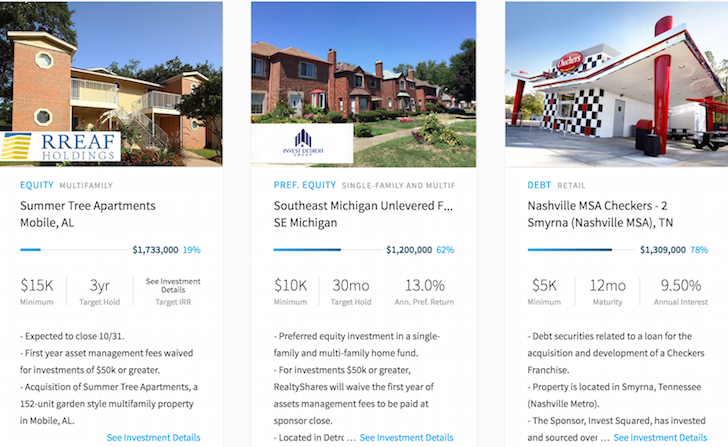 I’ve invested over $800,000 in real estate crowdfunding to take advantage of lower valuations and higher net rental yields in the heartland of America. My target return ranges from 8% – 12%. HOW DO I INVEST IN VENTURE DEBT? As far as I know, becoming a limited partner in a venture debt fund is largely through invitation or connections. There are no publicly listed venture debt only companies to invest in on the stock exchange or any exchange for that matter. You need to know someone who is already an LP or a Managing Partner to invest. The fund I invested in is still raising money if you are interested in an introduction. But their minimum is in the multiple six figures. I definitely do not recommend allocating a majority of your investments in venture debt or venture capital, although that’s how many people have achieved enormous wealth over the past several decades. My venture debt investment consists of all new money I’ve saved over the past year and a half and represents roughly 15% of all equity and fixed income investments and 3% of my overall net worth. In other words, if my venture debt fund blows up, I’ll still be able to afford Rhino, my snazzy Honda Fit! Track Your Net Worth Easily For Free: In order to optimize your finances, you’ve first got to track your finances. I recommend signing up for Personal Capital’s free financial tools so you can track your net worth, analyze your investment portfolios for excessive fees, and run your financials through their amazing Retirement Planning Calculator. Those who come up with a financial plan build much greater wealth over the longer term than those who don’t! About the Author: Sam began investing his own money ever since he opened a Charles Schwab brokerage account online in 1995. Sam loved investing so much that he decided to make a career out of investing by spending the next 13 years after college working at Goldman Sachs and Credit Suisse Group. During this time, Sam received his MBA from UC Berkeley with a focus on finance and real estate. He also became Series 7 and Series 63 registered. In 2012, Sam was able to retire at the age of 34 largely due to his investments that now generate roughly $210,000 a year in passive income. He spends time playing tennis, hanging out with family, consulting for leading fintech companies, and writing online to help others achieve financial freedom. Updated for 2019 and beyond. So far, my two venture debt funds have returned an IRR of 11.6% and 16.8%, respectively since 2015. But the economy is starting to slow in 2019, therefore, it’s important to lower my return projections. I am unaware of venture debt only funds. Can you name a few? It sounds like you have 15% of your money in it.. so that is great and must mean they exist.. but outside of silicon valley bank and 2 – 3 other competitors I think they are pretty rare (or so I thought..) and they are still a bank not a fund. Lastly, have you heard of revenue based financing? I think these banks / funds are the next big thing as a hybrid between venture capital firms and venture debt… actually looking to raise money that way myself. Not ashamed to say I had to read, reread and again read to even understand your article. I am learning slowly but alas learning! Hope one day to be “multiples” of an accredited investor so I can get into some more sophisticated investments. of course, at that point, even average public market returns will be more than sufficient to meet my needs and have a little fun. Maybe as something to enjoy doing and staying sharp in the realm of finance. Guessing your net worth–“multiple hundreds of thousands” and three percent of your net worth implies to me you are investing between 200 and 500 k and this translates to a net worth between 6.7 and 16 M–though based on your posts I’d put it towards the 7-9 M range–not sure you have broken 10—yet. How did I do? All I can say is I drive a 2015 Honda Fit. High rolling babay! There ARE public vehicles that do this. Business Development Companies (BDCs). typically yield 10%; and have been rocked in the market lately. May be a good time to buy in. Have a ticker of these BDCs? I’d love to check them out. Are they pure plays? PSEC 14.6% yield; $3B market cap. 4M shares per day (very liquid). A venture debt fund would have NO liquidity. HTGC 9% .9B … There’s probably about 6-10 others. As you say in other posts; options have value. These give you options. i.e. liquidity. public diligence etc. Thanks! Will look into them. Who are the big players in this space? I invest in VC mainly through fund of funds and invest in some other private investments such as real estate,PE, and resources. With investing in VC it is very important to have access to top quartile/decile funds and often companies will make you invest in their inferior products to have access to their better ones. I’m curious how developed this market is and the size? Do Mezz firms invest in venture debt? Why I really like private investments in general, is that in exchange for the illiquidity there are opportunities that you just cannot access any other way. With real estate PE many of the best deals only a few investors in the world can really access, same can probably be said for VC/PE. TriplePoint Capital is one. There are a couple others. Thanks for this article. I didn’t know about this type of investment strategy. Always good to learn something new. Since I don’t know anyone personally in this field or probably have the net worth to invest in it, I’ll just keep on dollar cost averaging in an index fund as the market is nosediving like today. I dumped about $20,000 this week into the market and will let in some more. I’ve been sitting on about $70,000 in excess cash due to my home remodel. But my home remodel is taking a while so I overestimated how much I need. I’m hopefull the market will calm down, but who know ex I like to continue dollar cost averaging more during downturns. Sounds very similar to a hard money lender. What is the collateral in this case? Since the hard money lender would be compensated with a house if the loan were to be unpaid. Good question. Intellectual property, technology, subscriber base for tech/internet which might not be worth as much at all if a company is going under. Hence, the reason for investing in a broad portfolio with Tier 1 equity investors. Great article. I work in a similar space – real estate private equity. Our funds are structured very similar to venture funds. The work is interesting and fun. There is a lot of upside, though not as much as in venture funds that invest in something like early stage technology companies. But, we get to use leverage and there are also tax advantages unique to real estate. Someday I hope to be an LP rather than in-house counsel. Ah, so you are the ones who are buying up all the property and making things more expensive for us common folk! J/k, but would love to get your thoughts on this. Sam Zell timed his sale brilliantly. As you know, I love real estate, so this is another field I’d be interested in. But, I like the fact that I personally own the real estate, rather than work for a company that owns the real estate. EQR is still quite a force! I would rather been an owner of real estate rather than a worker, too. But you have to start somewhere. I enjoy doing my own real estate investing on the side, and what I learn from our business folks at work I can apply to personal investing. Due diligence on technology start ups would be more fun than reading surveys and property reports. I have a close friend in VC and it’s very fun to hear about his work! For sure. It’s the same old stuff when analyzing real estate. But tech startups is much more different, and more more fun for sure. I work in this space and love it. The work is riveting but the risks are immense. It’s very easy to lose money! 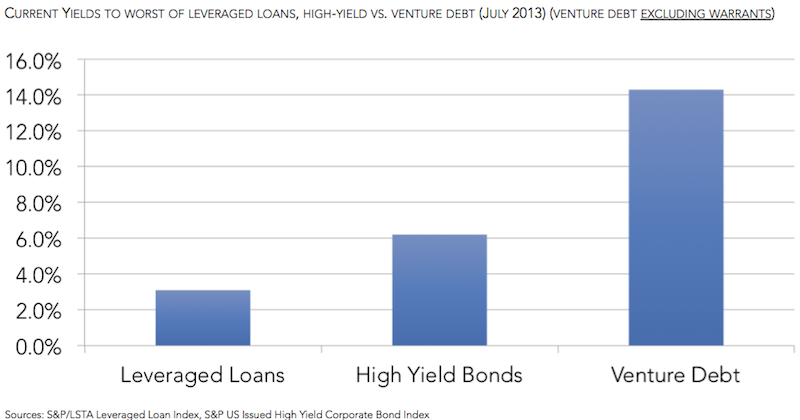 Most of what I do is more in the high yield space than in the venture space but we do cross over. Great overview for someone not familiar with the space though! I think if I were able to start all over and be in college, I would aggressively pursue a career in venture debt. It is my favorite investment style so far, and I agree with you that researching and meeting with new companies is riveting. Yep, by far the best part of the job is due diligence. Getting to speak with the PE firms and companies and then modeling out the projections is great. Love the analytics. 1. Barbell investment strategies. My first introduction to this was through Nassim Taleb, who seems to favor an extreme barbell strategy – not the kind you employ. Taleb is one of my favorite authors, though I don’t always agree with him. But expanding on the barbell investment strategy may be a good topic for a further post. Unless you have already done so. 2. You also reference “accredited investors” which is an arbitrary status that I find completely repugnant to our “free-market” system. It is just the government setting an arbitrary qualification on who qualifies with the end result of preventing the “non-rich” from participating in investments. Come on S, the government always knows best! In this case, they are just trying to protect people from themselves. P2P is a good alternative to venture debt for those who are not accredited. 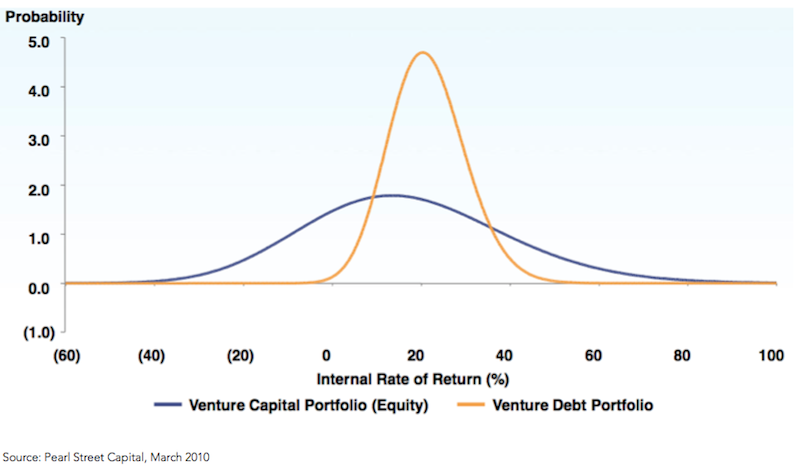 1) Nassim Taleb’s “barbell” would be exactly opposite the venture debt barbell shown above. He lives to insulate from volatility in the long (or fat) tail. 2) I totally understand your point about the government interfering with the free market by disallowing non-accredited investors from receiving offers. However, the being an accredited investor is far from arbitrary. In fact, it’s quite clearly defined. While I truly want to be with you on the hands-off-free-market argument, I just have to believe that these rules are in place for good reasons… like making sure your sweet Granny don’t get fleeced by a huckster. Also, there are some caveat’s here: unless an entity is marketing securities openly, or your sweet Granny complains to the SEC that she lost her life savings, the likelihood of anyone ever making a big deal out of non-accredited status is very low. Also, You’re in luck! The JOBS Act should be altering “crowdfunding” and marketing rules surrounding equity investment pending SEC issuance of related guidelines. So, get ready for Kickstarter on steroids! I meant arbitrary in that it the qualifications were arbitrarily decided by the SEC. Its easy to say that it is for the protection of people who may not otherwise have the means to invest, but why should the government decide that. Frankly, it is really there to protect the promoter not the investor. But it potentially locks out people who should be free to invest, who have the capital/resources, and who have the knowledge. Its basically the government saying you are too poor to invest in these sophisticated products, we know better than you, so you cannot participate. Only rich people can invest and earn these great rewards. The best revenge is to therefore get rich and price the government wrong! But then you’ll probably have to pay more taxes. No escaping them! The best outcome is to let me invest my money where ever I want and let me worry about the downside risk. But as I said, the accredited investor rules really protect the promoter (not the investor). Most people probably don’t care, but it should bother voters that there is a whole set of rules that place some private investment offerings that may offer superior returns off limits because the government basically deems you to be poor. P2P is not the same, because you have to do your own work then. You could argue that P2P is much riskier than venture debt offerings. I think common law fraud protects investors sufficiently from promoters. Obviously, that was not the reason for your post, but it allowed me a forum to vent about something that I find incredibly bothersome. I would review subcription agreements and PPMs for clients, yet I personally was unqualified for the investment due to the AI rules (no longer – but beside the point). May or may not offer superior returns. Nothing to get your shorts all twisted about! LOL! Your long run wealth is better served by sticking to standard products. Lottery tickets (venture capital) can be purchased by anyone at your local Seven-Eleven! You may be smart enough to weigh the risk, I may be smart enough to weigh the risk, but man… the average american is dumber than a bag of hammers when it comes to evaluating investment risk. The accredited investor system is in place because of past examples where a herd of grannies were lured into dumping their life savings into some flim flam deal. It bugs me too… but I get the logic behind it. If you don’t have a $1 million net worth or income of $200k a year, just wait a couple years. It’s not a huge hurdle to get over for a clever hustler. But it is a huge hurdle to get over for someone who isn’t sharp. And I guess that’s the point.